A recent harvest gleaned from my neighborhood. The wild blackberries grow in abundance here in the Pacific Northwest, lining parks, trails, roadsides, and just about everywhere else you can imagine. In these public areas it’s easy to find places to pick berries and I can guarantee that I’ve eaten my weight’s worth this summer. 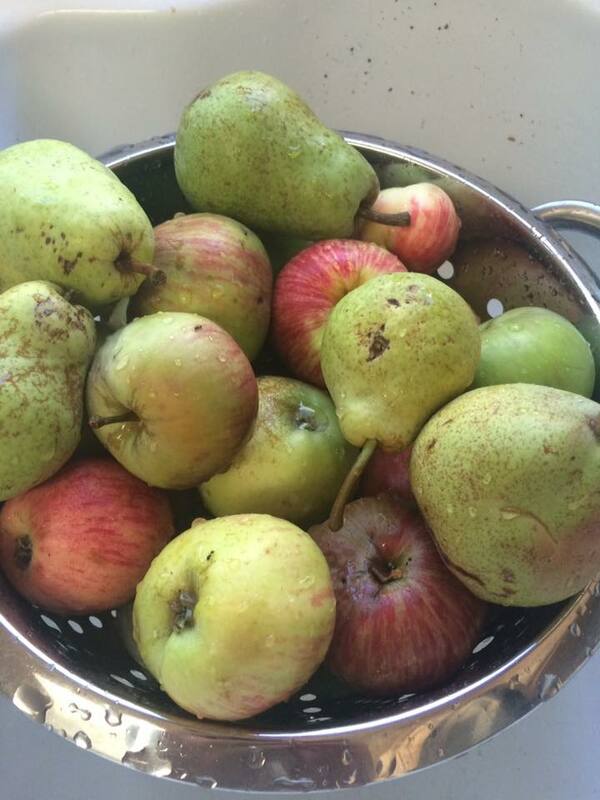 Another thing that is abundant this time of year are apples and pears. They are so abundant in fact that I can easily guide you to a half a dozen houses within a short distance of my home whose yards (and streets) are inundated with fallen fruit. The smell of fermentation indicates to me that my neighbors could use some help to ensure that all of that good fruit doesn’t go to waste. So I decided to do some research on the ins and outs of urban gleaning before raiding the neighborhood. Here are some tips I found. According to Amy Gates of BlogHer.com, any fruits and vegetables on public land or spilling over fences are ripe for the taking. This can be a great opportunity to scout out alleys, schools, and parks where neighboring fruit trees hang over the fence and periodically visit those locations. Gates goes on to advise that even though fruit on public land is fair game, it’s always best to get the permission of the homeowner and thank them for sharing their harvest with you. She even advises to go back and share some of what you made with the fruit with that person. In an excellent article on OrganicGardening365.com, James Early shares his experience where a CSA had excess at the end of the season and invited their members to glean whatever crops they wanted. He cautions us to be considerate of others in the community who might be gleaning as well and only take what you can either use or preserve. A good rule of thumb is to not let anything go to waste. Whether you’re out for a walk, run, bike ride, or drive, Julia Hebaiter on WeekendNotes.com reminds us to keep a bag handy should any impromptu gleaning opportunities arise. It certainly adds nice variety and adventure to the average walk or run. With this new information, I decided to carry a plastic grocery bag with me on a recent run through the neighborhood. I happened upon a park where an apple tree grew over the fence and several apples had fallen on the ground. I found a handful of apples that had fallen to the ground and had only minor bruises. I opted not to pick any from the tree without talking to the homeowner. I then came to a house where pears and apples were spilling into the street and gutter and filled my bag to the brim with slightly blemished fruit– again, opting not to go into the yards or pick from the trees. I took the harvest home (pictured), cut around the bruises, and made some incredible apple juice with my kids. That party came to an abrupt halt when my 2-year-old put a rock in the juicer. I am happy to say that both the juicer and the 2-year-old survived the ordeal. The next challenge in my journey as an urban gleaner is to take it to the next level and ask homeowners for permission to harvest the fruit in their yard. Have you done any urban gleaning? Do you have any ground rules to add? Please share in a comment or on Twitter and Facebook.